I don't really know if I have a set "process" when I go to make a card that I do every time. I DO know that I usually find either a sketch or a stamp I want to use first. If I want to use a particular stamp, I look for a sketch (or think of one) that will fit the positioning of the stamp. If I start with the sketch, I then pick a stamp for the positioning of the main panel of the sketch. Today, I'll carry you through my process for my "Little bit of YOU in Me" card shown here (I thought it was a fitting sentiment, since we're all trying to draw inspiration and learn from all the Divas--including me!). When that's all decided, I usually go ahead and stamp my images onto whatever cardstock, so it can get good and dry while I pick out other stuff. At this point, I'll usually start cutting my pieces and lay them out for the "jist" of what the card will look like, but without glueing down ANYTHING. This is when I may make color changes or paper changes or start all over--wink!! For this card, I decided to tweak the sketch and make it square and add just a little sumpin' sumpin' by adding the Nestabilities shaped layer and its tiny hand-cut mat behind the circle, because scallops? Not so manly. I start to think about embellishments and details now, once I have it all laid out. This is the really fun part where you can really add just the right thing or touches for that "wow" factor we all strive for! Add ribbon?, Sentiment placement?, Machine stitching?, Prima flower?, Brads?, Piercing?, Buttons?, and so forth. I envision what it would look like if I did "such and such" and where. It's important to figure all this stuff out before you actually glue it together. Since this was a more masculine card, no flowers were necessary, but brads, piercing and a little touch of ribbon was in order. Sometimes you have to have the embellishments and little treatments in mind all along in the cardmaking process, but I seem to actually "do" them last. I admit I am addicted to foam boosters (Jody Boosters, SU! Dimensionals, etc.). I ALWAYS use them in some way to pop a layer or two! I will never play in a challenge where I can't use them. EEK!! Here, the white circle is popped up on the green and the Nestie shape is popped up on the blue square. I finally get to glue everything down without gluing my top layer to the card base. In other words, for this card, I built it all on top of the navy blue mat. The very LAST thing I do is glue the top entire layer onto the card base (or sometimes pop it up on foam boosters, too!). This way, if I decide to add anything last minute, I still can without it showing through to the inside of the card (think brads here.) I like the inside of my card base to be "clean". So I'm not sure if it always works out this way. Sometimes certain steps in the process take longer to brew than others (color placement, ribbon placement, etc.)! If I'm following a color challenge, it's a little easier, I guess, but they aren't my favorite. I don't want to feel limited!! Everybody has their own way of making a card or project. This is just my way. You have to decide and do whatever works for you! I hope you enjoyed this little "walk through"!!! As always, we'd love for you to play along with us! 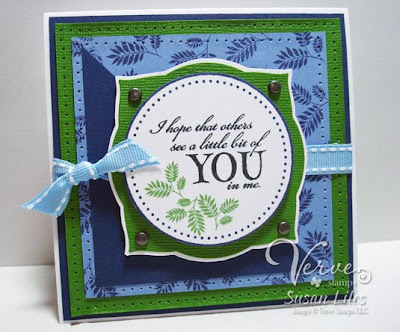 Just make a project or card that shows us your Divine Details. Verve Stamps are not required, but if you've got 'em we love to see 'em! Then just add a link to your creation to the Mr. Linky form on the Project Parade Day 1 post before 8PM Mountain on Saturday, August 1. Two lucky participants will win a stamp set of their choice from the Verve Store. We've also hidden another $25 gift certificate somewhere along the parade for a random commenter. So if you like what you see, be sure and give a little shout out in the comments of each post! Have fun and good luck! SUSIE Q-TIP: All of the above.